Purdue University researchers have developed a new flexible and translucent base for silicon nanoneedle patches to deliver exact doses of biomolecules directly into cells and expand observational opportunities. "This means that eight or nine silicon nanoneedles can be injected into a single cell without significantly damaging a cell. 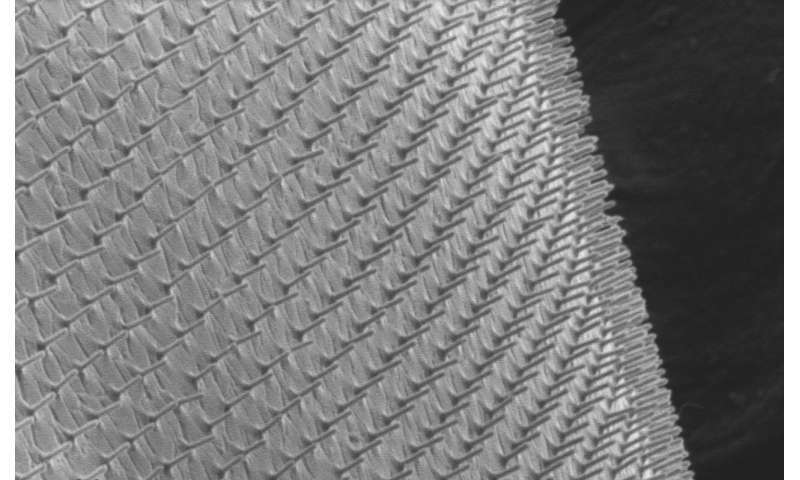 So we can use these nanoneedles to deliver biomolecules into cells or even tissues with minimal invasiveness," said Chi Hwan Lee, an assistant professor in Purdue University's Weldon School of Biomedical Engineering and School of Mechanical Engineering. A surgeon performs surgery on the back of a hand of a patient who has melanoma. Purdue researchers are developing a new flexible and translucent base for silicon patches to deliver exact doses of biomolecules directly into cells and expand observational opportunities. The researchers say skin cancer could be one of the applications for the patches. Silicon nanoneedles patches are currently placed between skin, muscles or tissues where they deliver exact doses of biomolecules. Commercially available silicon nanoneedles patches are usually constructed on a rigid and opaque silicon wafer. The rigidity can cause discomfort and cannot be left in the body very long. "These qualities are exactly opposite to the flexible, curved and soft surfaces of biological cells or tissues," Lee said. Lee said the researchers have resolved that problem. "To tackle this problem, we developed a method that enables physical transfer of vertically ordered silicon nanoneedles from their original silicon wafer to a bio-patch," Lee said. "This nanoneedle patch is not only flexible but also transparent, and therefore can also allow simultaneous real-time observation of the interaction between cells and nanoneedles." A study on the new procedure was published today (Nov. 9) in Science Advances. The collaborators from South Korea's Hanyang University and Purdue's Weldon School of Biomedical Engineering and School of Mechanical Engineering received joint support from the United States Air Force Office of Scientific Research and the Korean Ministry of Science and ICT to complete this study.The nanoneedles are partly embedded in a thin flexible and transparent bio-patch that can be worn on the skin and can deliver controlled doses of biomolecules. Lee said the researchers hope to develop the patch's functionality to act as an external skin patch, lowering the pain, invasiveness and toxicity associated with long-term drug delivery. In this technology's next iterations, Lee said the researchers plan to test operational validity of the patch's capabilities monitoring cellular electrical activity or treating cancerous tissue. This technology aligns with Purdue's "Giant Leaps" celebrating the university's global advancements made in health, space, artificial intelligence and sustainability highlights as part of Purdue's 150th anniversary. Those are the four themes of the yearlong celebration's Ideas Festival, designed to showcase Purdue as an intellectual center solving real-world issues.